And heads to the bar. 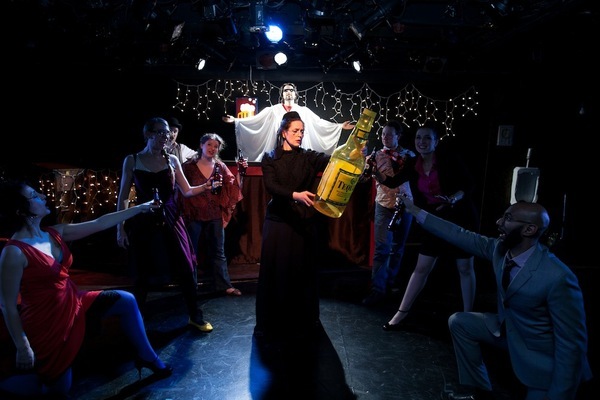 Bringing the hatchet-wielding icon of the temperance movement quite literally to life, Brooklyn-based company Opera on Tap presents its hit production of James Barry’s SMASHED: The Carrie Nation Story at the iconic Brooklyn watering hole and cultural hub Freddy’s Bar and Backroom in a fully immersive, all-bar-encompassing version of the production. New York, NY – On November 14th, Brooklyn-based company Opera on Tap will bring its hit opera SMASHED: The Carrie Nation Story by composer James Barry and librettist Timothy Braun to Freddy’s Bar and Backroom in a new fully-immersive production. Dubbed by Feast of Music as an “hilarious slapstick-style opera,” the show will take place in Freddy’s front room at 8pm and will be free of charge. Premiered at HERE Arts Center in April 2013, SMASHED was commissioned by Opera on Tap for the inauguration of its Roadworks Series. The series was created to promote new chamber works with a focus on American personalities and aims to provide immersive and entertaining work that is accessible to audiences who may otherwise be outside of the opera community. Future works include The Inner Circle, based on TC Boyle’s novel about Alfred Kinsey, by composer Daniel Felsenfeld and librettist Kate Gale (set to premiere in 2014), and more to be announced.